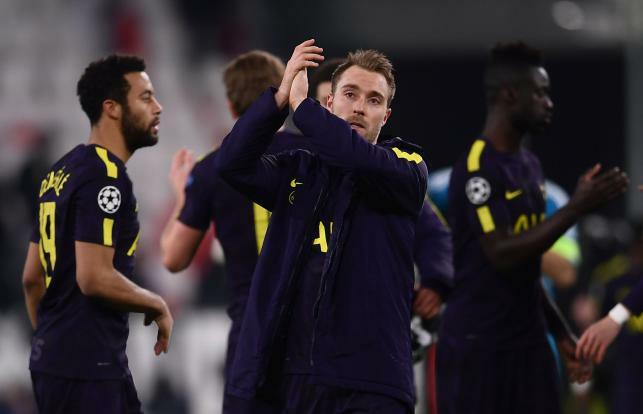 Harry Kane and Christian Eriksen pulled Tottenham back from the brink to hold Juventus 2-2 in Turin, spoiling what had looked set to be a Gonzalo Higuain one-man show in the Champions League last 16, first leg in Turin on Tuesday. Higuain had put Juventus-losing finalists twice in the past three seasons-two goals up within the first nine minutes at the Allianz Stadium. The Argentine’s lightning strike after just 73 seconds was followed by a second from the spot to leave Mauricio Pochettino’s English side reeling. But the 30-year-old missed two further chances to hammer home Juventus’s advantage in the first half, with striking the crossbar with a second penalty on the stroke of half-time. Kane had pulled Tottenham back into the tie, beating veteran keeper Gianluigi Buffon on 35 minutes with Eriksen whipping in the second with a 70th-minute free-kick to leave it all to play for in London next month. “The team showed real character to come here and challenge a team like Juventus,” said Pochettino who blamed the inexperience of his side for their sluggish start. Juventus coach Massimiliano Allegri warned they would be ready to challenge again for a place in the quarter-finals after extending their unbeaten run at home in Champions League fixtures to 23 games. “I don’t think there is any need to be depressed. If someone thought that Juventus could win 4-0 they were way off,” said Allegri. “Tottenham had a great game and turned things around. Pochettino’s side looked down and out after the first ten minutes with Miralem Pjanic lifting a free-kick into the penalty area and an unmarked Higuain volleying past Hugo Lloris, despite being in an offside position. Higuain’s second came from a penalty after Ben Davies fouled Federico Bernardeschi, with Lloris diving the right way but unable to stop the powerful drive. Higuain almost had a hat-trick, picking up a Pjanic pass to outfox two Spurs defenders only to shoot just wide. Buffon twice saved from Kane, including a header from point-blank range, before the striker finally broke through. Spurs began to take control, only for Serge Aurier to concede another spot-kick by hacking down Douglas Costa, but Higuain was denied a treble by the crossbar. Kane pulled Spurs back from the brink, latching onto a Dele Alli pass to round a helpless Buffon who had advanced off his line, making no mistake in front of goal. It was 24-year-old Kane’s seventh goal in Europe’s top club competition this season and puts him level with Steven Gerrard for the most scored by an English player in a single Champions League campaign. Kane was delighted to take two valuable away goals into the second leg at Wembley, meaning Juventus have to outscore Spurs to win. Asked if he feared his side were about to sink without trace after Higuain’s double strike, Kane told BT Sport: “We could have done, away from home in the Champions League. It showed character. Dane Eriksen got the second from a free-kick after centre-back Giorgio Chiellini fouled Alli, sending it low past a wrong-footed Buffon, who should have done better. “We are sure we will have chances at Wembley,” said Eriksen. Jan Vertonghen did well to prevent a late Higuain winner when he slid to intercept a Costa cross to prevent the Argentine tapping in.